Mahalo nui for your efforts to remove invasive species and restore the health to our watershed... We could not have accomplished so much without all of your hands and hearts! Join the effort! To educate the public about Hawai‘i’s native unique freshwater species and the effect of human influence on their populations, a collaborative effort was established between the University of Hawai‘i at Mānoa Center for Conservation Research and Training (UH-CCRT) and ‘Iolani School. Together, classroom curriculum and field protocols were developed for use in K-12 public and private schools in the Honolulu area, emphasizing environmental awareness through three sequential freshwater stream and watershed lessons (Figure 1). 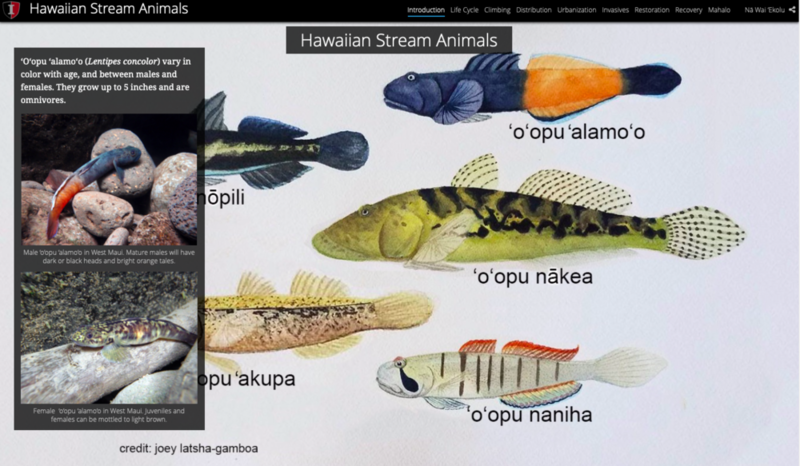 Please visit our interactive ArcGIS Story Map to learn more about native and invasive stream animals and our stream restoration project in the Ala Wai Watershed! To download more information, click here. To download a copy of our liability waiver, click here. With special thanks to ABC stores, EE Ford Foundation, Kokame Family, and 'Iolani School for supporting this work.